A great guitarist knows that a single, soulful note can say volumes, that both speed and silence are merely tools to be used to make a song its best. He or she understands that technique and emotion go hand in hand to create style and that the song has to come before the performer. Understatement is often a musician’s best friend – always leave the listeners wanting more. 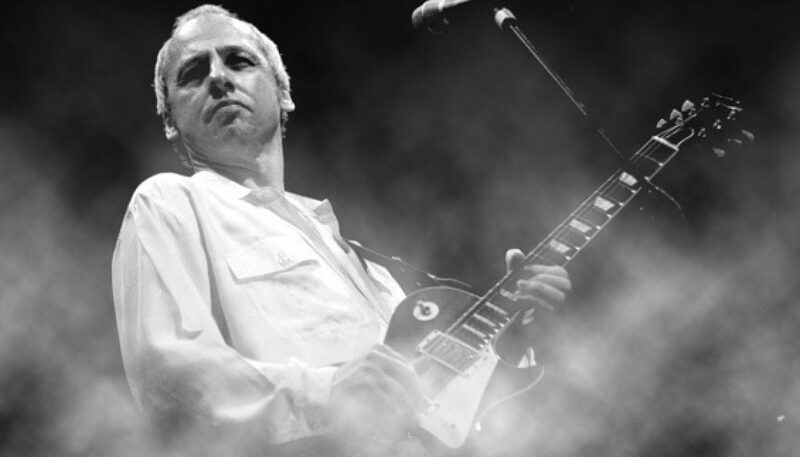 Born in Glasgow in August 1949, Mark Knopfler and his family moved to Newcastle when Mark was seven. He and his younger brother David were both musically inclined and Mark found inspiration in listening to artists as diverse as Django Reinhardt, Scotty Moore, Chet Atkins and Jimi Hendrix. His first guitar was a Hofner “super solid” with twin pickups and he played in many bands that came and went during his schooldays. Though left-handed, he played his instrument as a right-handed player. Unlike many of his peers, Mark stayed in school, studying journalism at Harlow Technical College (which led to a junior reporter job for the Yorkshire Evening Post) and eventually securing a degree in English from the University of Leeds. But music called to him all the while and he left his reporting job and worked as a part-time lecturer at Loughton College while performing with various pub bands in the area. In the mid-seventies, he moved to London, teaming up with younger brother David and John Illsley (David’s apartment mate) to form the band that would become Dire Straits. The demos for Dire Straits first, self-titled album were recorded in three sessions in the fall of 1977 and the album itself was released the following year. The band consisted of Mark on lead guitar and vocals, brother David on rhythm guitar, John Illsley on bass and Pick Withers on drums. The album gathered little interest at first until the song “Sultans of Swing” was released as a single. The moody tune about a jazz band in London became a big hit in Holland and then the rest of Europe and then across the Atlantic, hitting the top ten of both the England and American charts and promoting sales of the album. Their follow-up, “Communique,” hit number one in France’s album charts while “Dire Straits” was at number three. With each successive album, Mark took on more and more of the creative guidance and drive for the group. Their third and fourth albums, “Making Movies” and “Love over Gold,” were musically rich and layered and the songs, such as “Romeo and Juliet” and “Telegraph Road” both highly personal and poignantly detached. And his guitar work effortlessly mirrored the mood and personality of each song while still having its own unique voice. It was around this time, too, that CD technology was just coming into its own. Mark found the CD format very appealing as it allowed him to create longer albums, which in turn led to more complex music and extended arrangements and soloing. Dire Straits’ first CD album release, “Brothers in Arms” in 1985, was the first CD to sell a million copies. Following a very long and extremely successful tour, the band took a long break. Although they made a few special appearances, such as headlining Nelson Mandela’s 70th Birthday Tribute in 1988, they would not release another album until 1991’s “On Every Street.” The album and subsequent tour were certainly not as well received as their predecessors and Dire Straits disbanded in 1995. Mark lost no time getting back into the studio as a solo artist, releasing “Golden Heart” in March 1996, “Sailing to Philadelphia” in 2000, “The Ragpicker’s Dream” in 2002 and “Shangri-La” in 2004. The tour for “Shangri-La” included concerts in India and the Middle East, where tens of thousands of fans attended sold-out shows. He also continued to work in films, making soundtracks for “The Princess Bride” (1987) and “Wag the Dog” (1997). And he explored his country music influences, teaming up with childhood idol Chet Atkins for the album “Neck and Neck,” which also featured the song “Tears,” written by another idol, Django Reinhardt along with Stephane Grappelli. In 2006, Mark and Emmylou Harris released “All the Roadrunning,” an album of duets which hit the top ten in virtually all of Europe and led to a highly successful, albeit significantly scaled-down world tour and accompanying video/DVD. Most recently, Mark’s latest solo albums “Kill to Get Crimson” (2007) and “Get Lucky,” released just this last September 2009, continue to show him in fine form, both as a guitarist and a songwriter. He plans to spend 2010 being on tour. Sometimes a simple sounding fingerstyle acoustic guitar part takes a bit of thought and tinkering to create. David looks at how to go beyond the chords offered up on a typical Internet tab sheet in order to get more of the flavor of the original recording of this great Mark Knopfler song.